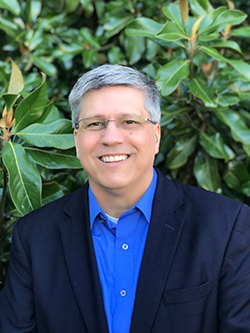 GAINESVILLE, Ga. (April 11, 2019) — The Board of Directors for Center Point, an agency dedicated to promoting the success of students and families through teaching and personal development, announced the hiring of a former pastor and North Hall high school teacher with a strong background in nonprofits as the center’s new Executive Director – replacing its longtime leader David Smith, who recently retired. Mark Mobley, who already has many ties to Gainesville nonprofits and the local area, will take over as Executive Director of Center Point on April 15, according to today’s board announcement. “He has significant expertise in community collaboration and partnerships, leading strategic planning efforts, and navigating organizational growth and change,” said Kathie Futrell, Center Point’s board president and a member of its executive search committee. Mobley and his wife, Robbin, along with their children, Mackenzie and Evan, live in Jefferson. Center Point was founded in 1967 by four Gainesville-area churches with the mission to supplement and broaden religious studies for local youth. Today, the agency offers counseling for children and families, religious education through its release-time classes for Gainesville High School, mentoring, substance abuse prevention, and teen pregnancy intervention services. Through the years, the agency’s mission and staff have evolved with a team that now includes educators, licensed clinical psychologists, therapists, and social workers. Center Point has offices in Gainesville and South Hall. For more information, visit the Center Point website at CenterPointGa.org.